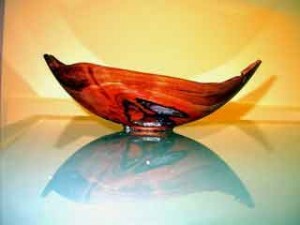 About 30 years ago, I was very new to woodturning. A friend was moving out of town and wanted to leave his old 12″ Delta lathe in my garage. I had an extra few feet of space between the front of the cars. He gave me a one hour lesson on how to use it, as well as some tools. They were all scrapers. I turned a few small bowls and in spite of a good amount of catches with the scrapers, I thought I needed a bigger challenge. Living in Atlanta at the time, I had seen a number of Ed Moulthrop’s bowls and admired them greatly. That had to be my next bigger challenge. 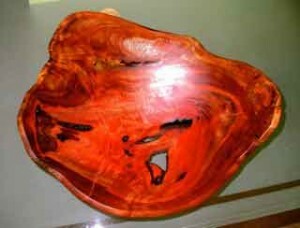 I soon found a “how to” article in Fine Woodworking on Moulthrop as well as an 18″ diameter piece of poplar or “Tulip Wood” as Moulthrop called it. The poplar had a purple streak in it caused by a lightning strike just like Ed’s. All was perfect to go. Luckily, I had a large face plate. I attached it to the end grain of the log just like the pictures in the article showed. I heaved it onto the lathe bed, cantilevered it from the spindle and turned on the lathe…. The big piece of wood went flying off the face plate, screws at great speed, spinning wildly between our two cars and slammed into the post between the two garage doors. Still spinning, it stood itself up like a top in place and finally came to rest! Maybe the screws were too short or too thin? Or maybe I needed to set the lathe belts at a slower speed? Thicker screws and slower speed and it ran fairly smoothly. Unaware of potential bearing damage, I even added bags of sand on the lathe stand to dampen any wobble. All was good. The outside turned easily but slowly. The form was off some, but never mind that, I had to keep going. The inside proved to be more challenging especially with a dull 1″ scraper. Once I was well into it, I had to move the tool rest inside the bowl as the scraper was too short to meet the interior. I got a few catches and bangs, hurting the back of my hand each time. Who knew you had to hold the scraper tip at a slight downward angle as well as keep it sharp? Now hot, shirtless and almost cutting the back of my hand wide open on the next catch, I wisely devised a scheme of a cloth glove with several layers of aluminum flashing over the back of it to absorb the shock to my hand. The flashing was held in place with, of course, duct tape. It worked! Catch, bang, no pain. Wow! What a great idea. Luckily, I finally finished the piece with my hand still a part of my body. The cloth part of the glove never caught on the bowl rim and ripped my hand off. My hand just had a few deep bruises on the back. Also, miraculously no damage was done to my wife”s car, nor mine. All was good, right? The purple streak in the wood turned out to be from a big poison ivy vine that had been on the tree, not from lightning. Deep poison ivy all over my chest and arms. Apparently it is true, you have to suffer for art-even when it is mediocre. I have since learned many things about woodturning, especially about safety. Being young, inexperienced and stupid is no way to be a woodturner. Go get some help! The April 2014 Issue of Wood News Online Celebrating Earth Day with Some Environmentally Friendly Finishing Tips!